Surf & Soul Ceremony – A beach, guest choice of course, will be sprinkled with luminaries, a tropical floral archway, and chairs dressed in white linen decorate this beachside wedding. A Caribbean cocktail party compete with canapés is held as the bride and groom step away for an hour photo shoot. The island chef tends to an oil-drum grill to get it primed and ready it for a succulent surf’n’turf seafood feast; think fresh shrimp, lobster, steaks and more. A towering tropical cake is also on the menu with layers of Caribbean inspired flavors – pineapple, rum, coconut and more. Serene Sailing – The British Virgin Islands are renowned for boating, and Peter Island Resort & Spa, a favorite among yachties, is now offering what else but a yacht-inspired wedding ceremony, Serene Sailing. The ceremony takes place on the high seas aboard the 41’ Silmaril, where an intimate wedding ceremony is performed. The reception continues on island as the bride and groom enjoy a one-hour sunset photography session and an evening dinner party in Peter Island private wine room. The chef prepares a personalized five-course meal, complete with wine pairing and of course, a lavish cake-cutting ceremony. The evening culminates with dancing under the starts to a Caribbean trio. 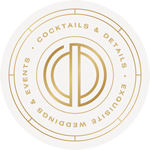 Cocktails & Details’ luxury travel department awaits an opportunity to serve you and your guests. If you are drawn to these packages, feel free to contact us! How can you look at the lines and textures of these designs and not fall in love? Christiane has dressed celebrities from LisaRaye to Pussycat Doll Jessica Sutta and has produced many other red carpet designs. I love how innovative her designs are—and could be perfect for the stylish bride or the uber fashionable bridesmaids. Check out more of Christiane’s designs at Christiane King. I must say that I am completely biased with this week’s selection. It is where Captain America and I renewed our vows and was our first of many trips to the beautiful country that is Jamaica. As a matter of fact—see that little gazebo? That’s where our ceremony was! Originally operating as its own resort, Sans Souci in Ocho Rios was purchased by Couples Resorts and added to their collection of beautiful Jamaican resorts. Everything from their delectable restaurants such as the Casanova (our favorite) to romantic and eclectic lounges like the Balloon Bar, there are so many hidden treasures and fun experiences lying within the gorgeous resort. Everything is very slow paced, comforting and visually stimulating—perfect for your honeymoon, destination wedding or getaway. Looking for inspiration and ideas for your home registry? You will absolutely love Nesting Newbies. Not only is the magazine fabulous, but their website is equally fabulous being full of great pictures, articles and more. The magazine’s issue features delicious recipes such as the Pineapple Teriyaki Meatballs and the Smoky Sweet Jalapeno Pork…. I think what I fell in love with the most are the tablescaping ideas. Sitting down? Good. Spa Parties: Spa parties allow everyone to take a break from their busy lives, relax and make new friends. You can book something at a local salon or spa or have a licensed masseuse come in to your own location. Plan to have your infused waters, teas, robes, and candles to create an atmosphere of relaxation, peace and fun. Add some light foods and music and you have a special time on your hands! Swap Party: These can be exciting and a great way to get rid of clothes that fill your closet that you have never worn (or will never wear again!). Your friends can bring everything from clothes to shoes to jewelry to swap with other participants at your party. Paired with great hors d’oeuvres and wine, you’ve got some of the best staples in life: good friends, good food and clothes! Spirits Tasting Party: Nothing is more fun than getting your girlfriends together for great food and drinks. At your spirits tasting party, you can pick out some of your favorite ideas for your signature drink at your wedding reception and get feed back from your girls. Have them bring some of their favorite recipes or check for some of our favorite cocktail recipes, because you know we’d never steer you wrong. These are just a few ideas to get you started on bringing some of your favorite people together. Do you have something special planned? Tell us about it! Once again, this week we are visiting another gorgeous location, or in this week’s instance, locations with the Gansevoort Hotel Group. With locations in New York’s Meat Packing District or Park Avenue, Miami, and Turks + Caicos, these deliciously styled properties are contemporary, lush, and located in some of the hottest areas for fine dining and entertainment. Take your pick: Explore + Enjoy! If you are looking for depth and inspiration, definitely check out Mochatini! I’m going to share with you some of my absolutely favorite places each Friday! Hopefully, they will give you some fabulous options for your honeymoon or your “mini-moon”. This week’s location is the ME Cabo Resort in Cabo San Lucas. The Melia is described as “Experience-based personality hotels in select urban and resort destinations” in areas like Cabo San Lucas, Cancun, Barcelona and Madrid. This Cabo San Lucas resort offers 155 guest rooms in all, including premium accommodations on "The Level," with breeze-kissed balconies, Baja views and custom works by artist Yuri Zatarain. Get intimate with essential luxuries like monsoon showers and Aveda bath amenities, and habit-forming extras like MP3 player docking and digital, surround-sound theater. With a variety of deliciously styled rooms, the ME Cabo has been the playground for happy newlyweds and celebrities alike. Fine Dining at The Pit, The Deck, and the gorgeous Passion Club as well as the aesthetic spa make for a well-rounded, entertaining experience. Don’t believe me? Check out this virtual walk through—don’t forget your room key! If you have fallen in love with the ME Cabo as much as I have journey over to the website or contact our travel division for more information and availability!